Daniels (foot) was placed on injured reserve Saturday, Adam Schefter of ESPN reports. Analysis: Daniels sustained the foot injury Week 11 against the Seahawks and was unable to play against the Vikings. The 29-year-old indicated last week his season could be in jeopardy and that has now come to fruition. The specifics of the injury remain unclear, though Daniels previously said he didn't suffer a fracture or undergo surgery. 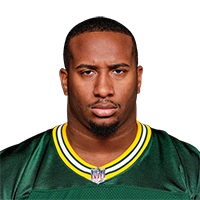 Dean Lowry, Montravius Adams and James Looney are the only remaining defensive ends currently on the Packers' roster. Daniels (foot) may not be able to retake the field in 2018, Rob Demovsky of ESPN.com reports. Coach Mike McCarthy said that Daniels (foot) will be out multiple weeks due to a foot injury, Jim Owczarski of the Milwaukee Journal Sentinel reports. Analysis: As expected, Daniels will miss multiple games due to a foot injury sustained during Thursday's loss to the Seahawks. A timetable for the 29-year-old's return remains undisclosed, but he'll certainly remain sidelined for Sunday's divisional tilt against the Vikings. As long as Daniels is unable to suit up, Montravius Adams will receive an uptick in defensive snaps. Daniels is expected to miss a few weeks as a result of the foot injury he suffered in Thursday's 27-24 loss to the Seahawks, Ian Rapoport of NFL Network reports. Daniels (foot) has been ruled out for the remainder of Thursday's game against the Seahawks. Analysis: Daniels suffered a left foot injury in the second half and his night is over as a result. For the rest of the contest, the Packers will be forced to heavily rely on Montravius Adams and Tyler Lancaster on the defensive front. Daniels is questionable to return to Thursday's matchup with the Seahawks due to a foot injury. Analysis: Daniels limped to the sidelines midway through the third quarter. If he cannot return, look for Montravius Adams and Tyler Lancaster to see increased reps on the defensive line. Daniels (shoulder) is absent from Friday's injury report, Ryan Wood of the Green Bay Press-Gazette reports. Analysis: Daniels is projected as a full participant in Friday's practice after being limited due to a shoulder injury earlier in the week. The seven-year veteran is on track for Sunday's game against the Dolphins, barring any setbacks. 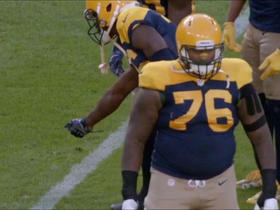 Daniels was added to the Packers' injury report Thursday with a shoulder issue, according to Rob Demovsky of ESPN.com. Analysis: Head coach Mike McCarthy indicated that Daniels' setback "is something that popped up on the practice field." It remains to be seen how the injury will affect Daniels' status for Week 10. Daniels recorded two tackles (one solo) and a sack during Sunday night's 31-17 loss to the Patriots. Analysis: Daniels was able to add to his sack total for the first time since Week 1, as he brought down Tom Brady during the loss. The seven-year veteran has 15 tackles and two sacks on the year. Daniels recorded three solo tackles, including one sack, in Sunday's tilt against Chicago. Analysis: Daniels and the Packers' defense struggled early on in Sunday's matchup with the Bears, but they stymied the Chicago offense in the second half. Daniels has recorded between 4.0 and 6.5 sacks every season since 2013 and is on pace for a quality campaign once again in 2018. Daniels (quadriceps) is participating in team reps during Monday's practice, The Athletic's Michael Cohen reports. Analysis: Daniels has been either sidelined or limited to individual drills since suffering a quadriceps injury in late July, but he's now inching back to full activity given his participation in team reps Monday. Friday's tilt against the Raiders presents what will likely be Daniels' last chance for preseason action, but the Packers won't rush the timeline of their starting defensive end if he's not ready. Daniels (quadriceps) will be a limited participant in Monday's practice, The Athletic's Michael Cohen reports. Analysis: Daniels originally returned to limited participation in practice during Sunday's training camp session, and he'll test out the injured quad again Monday as the Packers won't rush their starting defensive lineman back into full action. It wouldn't be surprising to see the team keep Daniels sidelined for Thursday's preseason tilt against the Steelers. Daniels (quadriceps) returned to practice Sunday, Michael Cohen of The Athletic Wisconsin reports. Analysis: The Packers are suddenly getting healthy, with Daniels and Muhammad Wilkerson (groin) both taking part in drills Sunday. Daniels himself missed the better of the last two weeks due to a quadriceps injury, which may have been precautionary due to the team's noted wariness to press any player with a soft-tissue injury. Nevertheless, he'll again anchor what is probably Green Bay's strength on the defensive side of the ball in 2018. Daniels did not participate in Monday's practice due to a lingering quadriceps injury, Ryan Wood of the Green Bay Press-Gazette reports. Analysis: Daniels was able to return from the quad injury for a single practice last week, but hasn't seen the field since. Though the details of Daniels' injury remain undisclosed, word out of camp is that the starting D-lineman's issue is considered minor. Despite this, Daniels has missed a significant amount of training camp, and his status warrants continued monitoring. If the 29-year-old is able to return to health, he'll jump right back into his starting role. 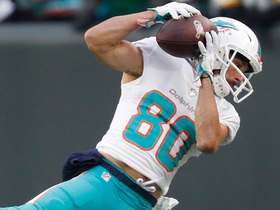 Daniels (leg) returned to practice Thursday, Michael Cohen of The Athletic Wisconsin reports. Analysis: Daniels injured his quadriceps on Monday and took a few days to recover. He figures to jump right back into his starting role along the Packers defensive line. Daniels, who injured his left leg during Monday's practice, is not expected to be sidelined for an extended period of time, Michael Cohen of The Athletic reports. Analysis: Daniels left Monday's practice early after suffering a minor leg injury, but Packers head coach Mike McCarthy said Daniels' issue shouldn't create any long-term problems. A clear-cut starter on the defensive line, Daniels could return to practice in a timely fashion if the injury is as minor as it sounds. Daniels left Monday's practice early with what appeared to be a left leg injury, Michael Cohen of The Athletic reports. Analysis: Daniels was forced to exit Monday's training camp session prematurely with both a member of the team's medical staff and equipment personnel by his side. Montravius Adams and Dean Lowry could see additional reps at defensive end if Daniels is sidelined for an extended period of time. Daniels recorded 49 tackles (34 solo) and five sacks over 14 games during the 2017 season. Analysis: Daniels tallied at least four sacks for the fifth consecutive year, and his 49 tackles tied a career high. He has been a key cog in the middle of the Packers' defense and will remain one in 2018. Daniels posted four tackles and a half sack in Sunday's overtime win against Tampa Bay. Analysis: Daniels accrued 58 defensive snaps Sunday, more than any other player on the Packers' defensive line. The sixth-year pro is one of the top defensive assets in Green Bay, which is why he plays so much. However, it often doesn't translate to great fantasy performances, making him a risky IDP deployment. Daniels had a season-high seven tackles and one sack against the Steelers on Sunday. 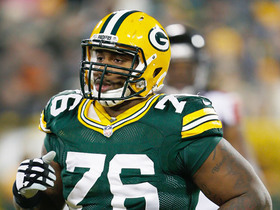 Analysis: Daniels played 53 snaps Sunday, the most out of any Packers' defensive linemen. He continues to be instrumental in run defense, but he'll have less opportunities to stop the run against Tampa Bay in Week 13, as the Bucs averaged under 24 rushes per game. Daniels had two tackles (both solo) in Sunday's loss to the Ravens. Analysis: Daniels' production was minimal a week after recording five tackles as well as his second sack of the season. He did, however, play 51 snaps Sunday, according to Rob Demovsky of ESPN.com, putting him over the 50-snap number for the fifth time in six games. Green Bay Packers defensive tackle Mike Daniels shimmies through two defenders for big sack. 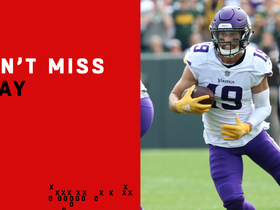 Minnesota Vikings quarterback Kirk Cousins finds wide reciever Adam Thielen for a 22-yard touchdown late in the fourth quarter of a Week 2 matchup in the 2018 season against the Green Bay Packers. 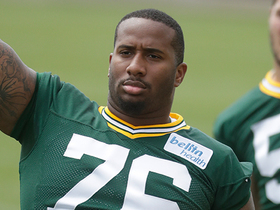 Green Bay Packers defensive tackle Mike Daniels left practice early Monday after a thigh injury. 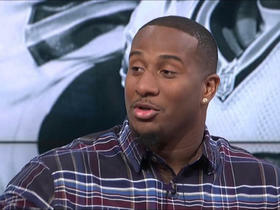 Green Bay Packers defensive lineman Mike Daniels joins 'NFL Total Access' to talk Packers football. 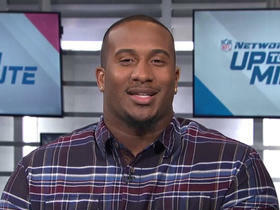 Green Bay Packers defensive tackle Mike Daniels joins "NFL Total Access" to talk about the team's offseason additions, quarterback Aaron Rodgers' early interceptions through OTAs and more. 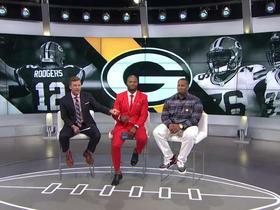 Green Bay Packers defensive tackle Mike Daniels joins "Up to the Minute" to talk about Packers' new defensive coordinator Mike Pettine, linebacker Clay Matthews, quarterback Aaron Rodgers' contract and more. 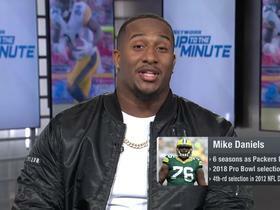 Green Bay defensive lineman Mike Daniels joins 'Up to the Minute' to talk about new Defensive Coordinator Mike Pettine, the 2017 season and more.